Life Signs is quirky yet entertaining game from Japanese developers Tendo Dokuto that transforms gamers into a doctor as they strive to become the country's best intern. Best described as a medical "Sim", Life Signs puts you directly in the shoes of a doctor as they attempt to perform a variety of procedures on their patients. Some of the surgery that you perform does involve life and death, whereas, other surgeries are less dangerous... such as minor cuts and braises. As a doctor, you also need to communicate with a wide variety of medical staff and patients that at times, it feels like a E.R. episode, although with the quirkiness of the Japanese. Experience medical drama in this innovative and exciting adventure game – feel the adrenaline rush of dealing with non-stop medical emergencies as you live the life of ayoung, motivated doctor! Interact and communicate with staff and patients that you meet throughout the game – review and discuss patients’ medical records, ask questions as you diagnose patients’ problems and resolve volatile personal conflicts before they boil over! Find out what it is really like to juggle your personal affairs with the demanding lifestyle of a medical intern! Examine, diagnose and operate on patients using the unique stylus and touch-screen features of the Nintendo DS to perform actual medical techniques and use medical instruments - take auscultation, pulse rates, incisions, sutures and many more! Play many mini-games as the story unfolds! The game itself is a collection of mini-games with the predominant game being that the player must diagnose a patient and then proceed with the relevant medical treatment. Of course, as the game progresses, so does the difficulty of the mini-games as you attempt to save all your patients. The game can also be quite challenging at times and difficult because the attention to detail and the realism is quite unfounded on a game like this, especially on the DS. Needless to say, some of the surgery can be quite tricky yet thoroughly satisfying if you can pull it off. 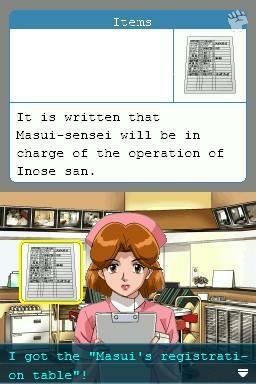 The control system is quite innovative on the Nintendo DS as the player uses the stylus to perform a variety of different medical procedures such as open-heart surgery to something less strenuous such as a cut on the arm. I must admit that the surgeries are quite realistic at times as you cut skin, bone and muscle to reach your intended destination. So be warned, those who are a little squeamish may wish to look elsewhere as cracking open rib cages is not the most pleasant thing in the world. There are also a variety of different game modes, ensuring that the gamer has a variety of options while they play, whether it's for a long or short session of gaming. Graphically, the title is quite "anime" in its presentation which is not a bad thing, although it does look a little dated. It's quite impressive how the developers have recreated the human body in the game so kudos. Musically, the title is quite MIDI in its presentation, although it is quite bopping and drama-esq at times. The sound effects also go hand in hand with the gameplay. 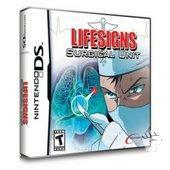 In conclusion, LifeSigns features a variety of different surgical procedures that features a rather sturdy yet difficult gaming engine but with those classic Japanese inspired graphics. The title contains some great sound effects and an interesting musical score that once again goes to the quirkiness of the Japanese in this fun and addictive game about being a doctor.